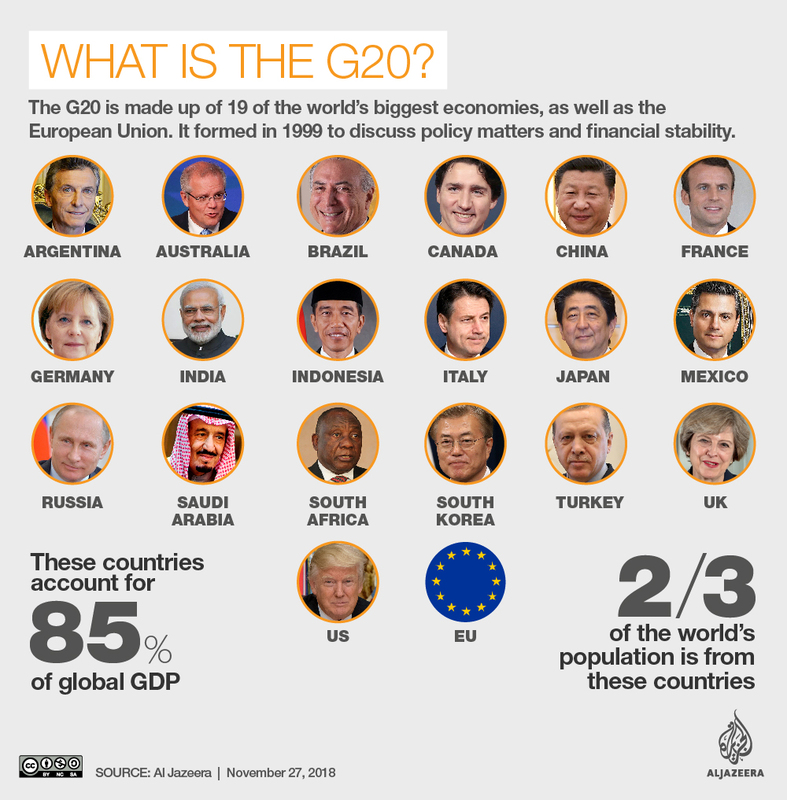 All eyes will be on Buenos Aires, Argentina on Thursday and Friday as leaders from 19 of the world’s top economies, as well as representatives from the European Union gather for the 13th G20 summit. This year’s meeting comes as tensions grow between China and the United States over trade differences, a conflict between Russia and Ukraine escalates and pressure mounts to hold Saudi Crown Prince Mohammed bin Salman to account for the murder of writer Jamal Khashoggi. Who will meet Saudi Crown Prince Mohammed bin Salman? 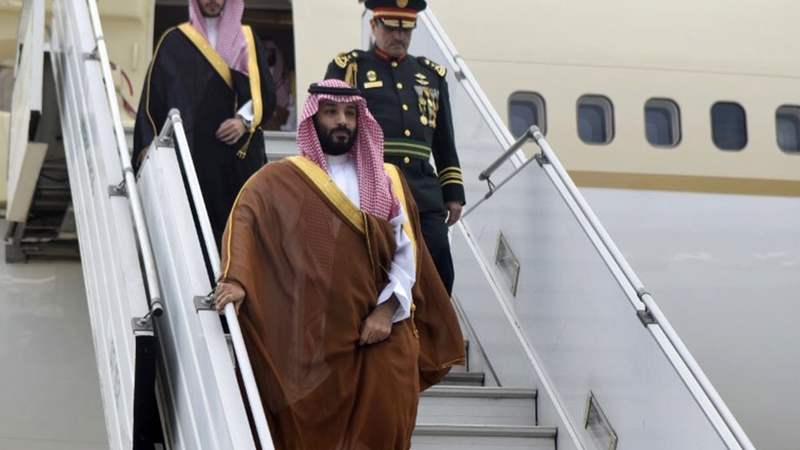 The Saudi Crown Prince, also known by his initials MBS, landed in Buenos Aires on Wednesday, two days before the G20 is set to begin. It will be his first chance to potentially meet Western leaders since the murder of Saudi journalist Khashoggi in Turkey. After offering several contradicting accounts, the kingdom admitted last month Khashoggi had been killed in its Istanbul consulate on October 2 and his body dismembered. Riyadh has said that Prince Mohammed had no knowledge of the killing, which Turkey said was ordered at the highest level of Saudi leadership. Erdogan ruled out King Salman bin Abdulaziz Al Saud, however. The murder has strained relations between Saudi Arabia and several other countries, with rights groups and politicians calling for Prince Mohammed to be held to account. Human Rights Watch submitted a request to Argentina’s federal judge on Monday, asking the country to investigate Prince Mohammed for possible war crimes in Yemen and the murder of Khashoggi. On Wednesday, a judge asked Argentina’s foreign ministry to seek information from Turkey, Yemen and the International Criminal Court. Among the few leaders Prince Mohammed is expected to meet is Russian President Vladimir Putin. The pair will discuss the killing of Khashoggi, but the “main aim” would be developing Russia-Saudi relations, said Putin’s foreign policy adviser Yuri Ushakov. Turkish Foreign Minister Mevlut Cavusoglu told German daily Sueffeutsche Zeitung on Tuesday that Prince Mohammed requested to meet Turkish President Recep Tayyip during the summit. UN Secretary-General said on Wednesday he is willing to meet Prince Mohammed at the summit to discuss an end to the war in Yemen. On Tuesday, US National Security Adviser John Bolton said there are no plans for a meeting between MBS and President Donald Trump at the summit. But White House Press Secretary Sarah Sanders said she could not rule out possible interaction between MBS and Trump at the summit. Although Trump admitted last week that Prince Mohammed may have known about the murder, the president said the US will remain a “steadfast partner” with the kingdom. The US placed economic sanctions on 17 Saudi nationals allegedly involved in Khashoggi’s murder. Rights groups have also vowed to protest against Prince Mohammed’s appearance at the G20. 2. Trump-Xi meeting: Will there be a breakthrough? Trump will host a dinner for his Chinese counterpart Xi Jinping on Saturday where the pair are expected to try to come some sort of compromise on trade. It will be the first meeting between the leaders of the world’s biggest economies since Washington imposed tariffs on $250bn in Chinese imports and China retaliated with its own measures. China hopes to convince Washington to hold off on hiking tariffs to 25 percent from 10 percent on January 1. Although officials from both countries have expressed scepticism, White House economic adviser Larry Kudlow said on Tuesday that the summit offers “an opportunity to break through what has been disappointing discussions” over the last several months. “In his view, there is a good possibility that a deal can be made and [Trump] is open to it,” Kudlow told reporters. But Kudlow cautioned that if conditions are not met on a number of issues, including intellectual property theft and other practices, the president is prepared to hike tariffs on Chinese imports. For the China’s part, Beijing’s ambassador to Washington said on Tuesday that his country is going into the G20 hoping for a deal, but warning of dire consequences if US hardliners try to separate the two economies. Speaking to Reuters news agency before heading to join Chinese President Xi Jinping’s delegation G20, Cui Tiankai said China and the United States had a shared responsibility to cooperate in the interests of the global economy. Trump recently cast doubt over his planned meeting with the Russian president. The pair are currently scheduled to meet on Saturday, but Trump said late on Tuesday that he may cancel the meeting due to escalating tensions between Russia and Ukraine. Kiev declared martial law in several of the country’s regions this week after Russia seized three Ukrainian ships near the Crimean peninsula. “Maybe I won’t have the meeting,” Trump told the Washington Post. “Maybe I won’t even have the meeting … I don’t like that aggression. I don’t want that aggression at all,” he said. Responding to Trump’s comment, a Kremlin aide said on Wednesday that the US should speak through established channels, not the media. The Kremlin also said it expected the meeting between the two leaders to go ahead. Russia annexed Crimea in 2014 and now controls both sides of the Kerch Strait where the incident took place. If the Trump-Putin meeting goes ahead, the two are expected to discuss the Intermediate-Range Nuclear Forces (INF) Treaty after Trump said in October the United States would quit the agreement because Russia was not honouring it. On Tuesday, US National Security Adviser Bolton said he believes the Trump-Putin meeting will be a continuation of their discussion in Helsinki. At that closed-door meeting, which took place in July, the two leaders said they touched on a range of issues, including international security and trade. The Helsinki summit was overshadowed though when Trump failed to challenge Putin over interference in the US elections. He was later forced to admit he misspoke and clarify that he does accept the intelligence community’s assessment that Russia did meddle in the 2016 presidential elections. As with other G20 summits, anti-capitalist and other protests are expected throughout conference. The major demonstrations will kick off with the People’s Summit on Wednesday. Participants of the alternative meeting will discuss a number of issues from food security to how to combat climate change. The People’s Summit will continue through Friday when a large demonstration is expected. 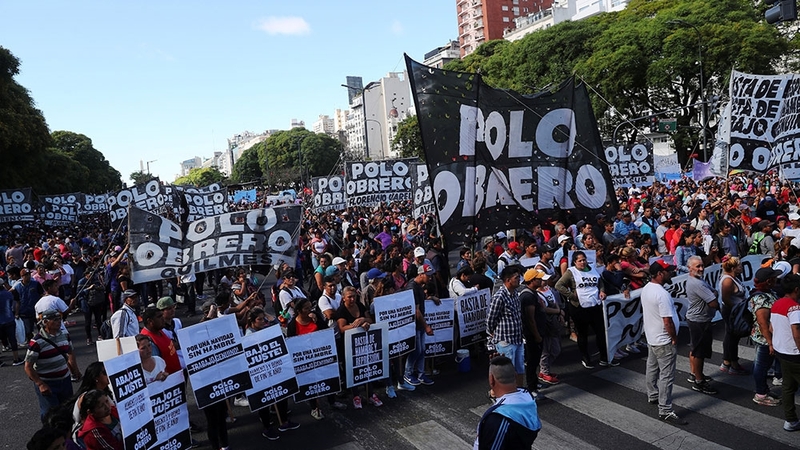 The Mothers of the Plaza de Mayo, a group of women whose children and grandchildren were disappeared during Argentina’s Dirty War, are also expected to protest on Thursday. Rights groups also plan to protest the potential appearance of Saudi Prince Mohammed over the kingdom’s role in Yemen and the murder of Jamal Khashoggi. Argentina has declared Friday a public holiday and suspended train service on Friday and Saturday. The government, which faces near daily protests over its economic austerity programme, has vowed to crack down on protests, saying “illegal acts” will not be permitted. Bullrich also told local media that residents should leave the city until the summit concludes. The agreement, announced in October, updates the 1994 NAFTA agreement and promises to lead to “freer, fairer markets, and to robust economic growth”. It is unclear who will sign the deal behalf of each of the countries. Canadian media reported on Tuesday that the final text of the agreement was also still being hammered out. If the agreement is signed on Tuesday, it will then be sent to each of the country’s legislatures where it must be ratified before it can enter into force. UK Prime Minister Theresa May will use the G20 to sell Britain’s post-Brexit trading future outside the EU. But Trump has done her no favours by mocking a hard-fought withdrawal agreement negotiated between London and Brussels. After a year and a half of arduous negotiations, the 27 leaders took less than half an hour to rubber-stamp a 600-page treaty on Sunday that sets the terms for the UK’s withdrawal from the European Union on March 29 and a 26-page declaration outlining ambitions for a future free trade relationship. May now faces the arduous task of winning parliamentary backing for the deal, which foresees London following many EU rules to maintain easy trade access, with the British leader expected to face fierce resistance in the coming weeks from both supporters and opponents of Brexit within her government and other opposition parties. 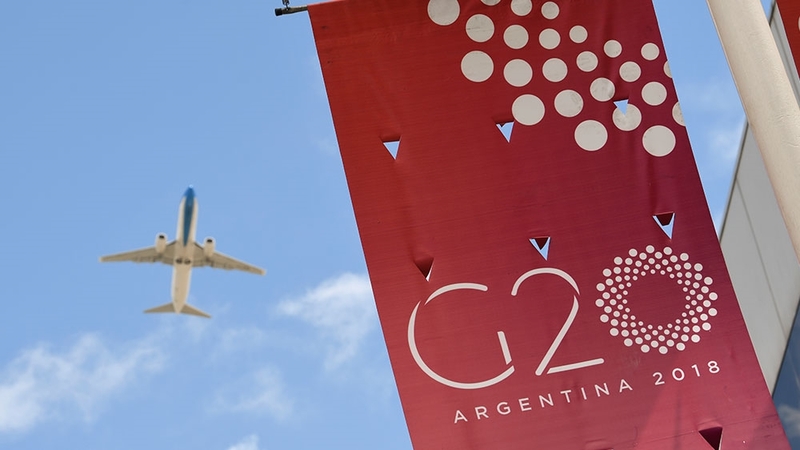 Follow all of the latest updates from the G20 here.